We all love nostalgia. From clothes to hairstyles, we sometimes find ourselves throwing it back more than we’re innovating. While this can be great for fashion, the same can’t be said for websites. I don’t know about you, but I don’t own a time-traveling DeLorean. I don’t even own a regular one. But there are times I feel like I must have somehow gotten up to 88 miles per hour while sitting in my desk chair when I see outdated websites. In fact, 94% of people cite design problems when asked why they distrust certain websites. If you’re generating traffic but not seeing a proportionate number of leads from your real estate website, it’s time to look into design as a possible culprit. You don’t even have to wait until the clock tower reads 10:04. We’ve compiled a list of five things you can change about your web design right now to start converting more leads. Pixelated Flash animations are a thing of the past, and rightfully so. Distracting, repetitive, and downright obnoxious, these constantly moving pictures ended up taking away from the content you had actually written rather than adding to it. We’ve now moved into a more sophisticated time in website design and blogging. It’s easy – if you feel like you need some sort of visual to get your point across, use an actual image. Articles with images get 94% more views than those without. Why? We live in a visual culture. Not only that, photos can also bring a little bit of color to your website where text can get a little dull. Not sure where to begin with replacing your animations with images? Check out this list of 53+ free image sources for your blog and social media posts. The quote above is really the crux of the matter with weird and silly font choices – people can’t read them. If you’ve provided content that no one can read, you might as well have not posted anything at all. This is why illegible fonts have gone by the wayside, and why still using them dates your site. Comic Sans and Papyrus tend to be some of the biggest offenders in this arena and should be eliminated. They (and others like them) are simply not professional and won’t lead to a potential customer seeing you as such. It’s much better to choose something you can find at Google Fonts. When it comes down to it, a font’s main purpose is to be read, and that’s it! If you could describe the font on your real estate website as cute, quirky, or different, it’s more than likely not the right one to use. Not including music is really a no-brainer. For one, there’s no accounting for taste. Even if you’ve chosen what you feel is the most neutral, crowd-pleasing track possible, there will always be someone who doesn’t like it. Moreover, people simply don’t like to hear sounds they didn’t initiate. Maybe they’ve got headphones in and your music blares over the top, making their ears hurt. Or maybe they’re in an office setting and your site has now embarrassed them in front of their coworkers. Whatever the circumstance, it’s a lot quicker and easier for someone to hit the ‘back’ button and find a different agent’s site than it is to try to figure out how to pause or stop something from playing on yours. This is really a no-win situation. Just don’t do it. While the idea of a hit counter (also known as a page counter, visitor counter, stat counter, etc.) may sound good, the negatives far outweigh the positives. For starters, they’re often just a disguise for spam. Downloading anything off the Internet to attach to your site is generally not a good idea and hit counters are no exception. Another negative is that they can give off an impression that you don’t necessarily want to have. Sure, in an ideal world it would show thousands of hits and people would think you must be popular and trustworthy. However, that’s generally not what happens. If your real estate site isn’t getting as many visitors as you would like, new visitors can see it and make a snap judgement to leave as a result. At that point, even if you are getting page hits, you’re still not getting any leads, which is the main point having a website! Lastly, as with everything this article talks about, they make your site look terribly out of date. Reputable sites have moved away from hit counters and yours should, too, if you want to be considered one. If you’re curious about your website’s traffic, there are still plenty of options out there that don’t show the information to your visitors. If you’re a Pipeline ROI customer, you’ll see your website traffic, where it’s coming from, your most visited pages, and any inbound links right inside your dashboard. If not (or if you’d like even more insight into your business), Google Analytics is a good option. It’s full of free features to help you analyze visitor traffic and get to know your audience better. There are no ifs, ands, or buts about this one. 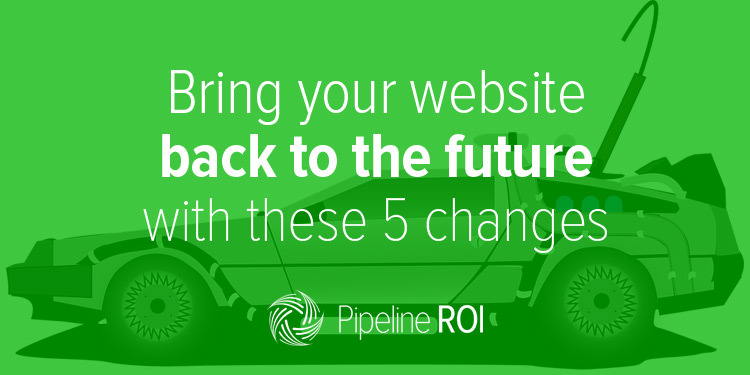 This is THE number one thing you can do to bring your site out of the past. Your site has to (and I do mean has to) be mobile-friendly. Whether or not you use a smartphone or tablet to do your Internet searching, it’s now by-and-large the way it’s being done. In fact, as of 2014, mobile usage surpassed desktop usage globally. It’s one of the reasons Google made a significant update to their algorithm in April 2015 favoring mobile-responsive websites in their results listings. Not only that, millennials are quickly entering the housing market in droves. And what can millennials not get enough of? Their smartphones. No matter how well your real estate business is doing, you’re losing more potential customers than you’re gaining if your website is difficult or downright impossible to navigate on mobile. Pipeline ROI provides its users with completely mobile responsive websites in order to help them provide the absolute best experience for their visitors. After all, we know exactly how important it is to have this feature. Curious as to what your site looks like across different platforms? Check out Responsinator. Just type your URL into the bar at the top and you’ll be able to see what customers see when they view your website on different devices. If it doesn’t look right, you know where to find us. If your website has turned into a relic of times gone by because you haven’t modernized any of these features, the time to do it is now. You’ll be amazed at the difference the design of your website can make in bringing in new leads. Now, we know you’re in the real estate business, not web design. That’s why we handle all the dirty work for you in creating everything you’ll need. You just have to make it happen. Basically, we’re the Doc to your Marty.